The mouse found commonly in buildings is the house mouse. The fur colour varies between light brown and grey. Body length varies between 60-90mm and the tail can add an additional 100mm. The most common first signs of a mice infestation are the small black droppings about 5mm-8mm in length – similar in size and shape to a grain of rice. Other signs include chewed holes in woodwork, plastic ducting and other building materials. At night time in particular, the scratching and scuttling noises of mice can be heard when the rest of the building is relatively quiet. Mice breed all year round and the female will have 5-10 litters every year. It is easy, therefore, to see why mice can become a major problem if undetected in commercial buildings. Their favourite foods are cereal products, although they will eat almost anything. They also foul food with urine and droppings. Mice will gnaw their way through wood to get to sources of food. Droppings are often black, rod shaped and 3-6mm long. Fresh droppings will be soft and moist. 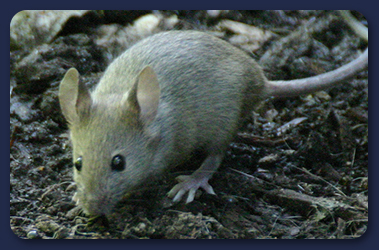 Each mouse can leave approximately 80 droppings per day. Common places to find mouse droppings are under the kitchen sink, around central heating boilers and in roof spaces. These are dark grey marks left on surfaces by repeat contact with the oils in mouse fur. Mice gnaw continually on materials such as wood, carpets, paper, pipe, cables and furniture. Check for damage to foodstuffs in cupboards. How can you prevent mouse infestation? Remove potential nesting sites by keeping yards and gardens clean and tidy, and by cutting back over grown areas.